Use Learning Pathto give your users a custom, in-app Help experience that is tailored to your environment and the specific usage and workflow of your organization. Learning Pathfacilitates learning and adoption of Dynamics 365 (online)and organizational processes, ensures that data is entered and interpreted consistently, and reduces errors and support calls generated by users. Watch a short video (1:50) about Learning Path. Learning Path is currently not available on Microsoft Dynamics 365 Germany. However, it will be made available over time. Please check back for the latest information. How is Learning Path different from customizable Help? How does Learning Path work with multiple organizations? Customizable Help allows you to override the default Dynamics 365Help and point users in your organization to a different URL for Help. Or you can override the Help for a highly-customized entity so that you can better describe your workflow. Learning Pathlets you add customizable Help that users see in Dynamics 365when they open a page, perform an action, or click the Help button ?. You can use customizable Help or Learning Path, but not both. For more information about customizable Help, see Customize the Help experience. Be using Dynamics 365 (online). Have December 2016 update for Microsoft Dynamics 365 (online)installed. Note that users can view the Learning Pathcontent created by Microsoft if they have Dynamics CRM Online 2016 Update 1or later installed, but you must have the December 2016 update for Microsoft Dynamics 365 (online)to author Learning Pathcontent. To turn Learning Path on: On the nav bar, click the Optionsicon > Opt in for Learning Path. For more information, see On/off switch for Learning Path (guided help). Have the System Customizer or System Administrator Role, or another role that has the Learning PathAuthoring privilege. Enable Learning Pathauthoring. This creates the Office 365Learning PathAuthors security group. Be a member of the Office 365Learning PathAuthors security group. At this time, these clients support Learning Path: web client, interactive service hub, and Dynamics 365 for tablets. Learning Pathis an optional feature that can be turned on or off for your organization. You can display Learning Path content included with Dynamics 365, create your own Learning Pathcontent for your users, or both. Sign in to Dynamics 365with an admin account. Click Settings, and then click Administrationunder System. On the Administrationpage, click System Settings. On the Generaltab, under Set custom Help URL, select Yesfor Enable Learning Pathand Enable Learning Path Authoring. You can enable Learning Pathor customizable Help, but not both at the same time. Confirm that Use custom Help for customizable entitiesand Append parameters to URLare set to No. If you're not a member of the Office 365Learning PathAuthors security group, you'll see the following error message when you open the Learning PathContent Library. Go to the admin portal for your Office 365tenant by clicking the Navigate to other applications(waffle) button in the top-left corner of the page when you're signed in to Dynamics 365, and then select Admin. You may be asked to re-enter your password. In the Admin center, click Groups. On the Groupspage, select the Learning Path Authorssecurity group. Click Editin the Membersrow to add users to the group. Click + Add members, and then specify or search for the user(s) you want to add to the group. Click Savewhen you're finished adding users. Another way to assign the group to a user account is by selecting Users > Active Users, selecting the user you want to add, and then clicking Editnext to Group membershipsto select the group(s) to add the user to. When you publish Learning Pathcontent, you can use Publishing Environments to control which organizations associated with the tenant your content is published to. To publish different content to different organizations, create multiple publishing environments and add each organization to one or more of them. Dynamics 365uses security roles to determine what Learning Pathcontent is displayed when a user clicks the Help button, navigates to a page, or performs a defined action in Dynamics 365. The roles used in Learning Pathare the same roles used in your Dynamics 365organization for security and data access, but you can create Learning Pathcontent for any or all of the Dynamics 365security roles. Typically, you want the security roles in the Learning Pathdesigner to match your Dynamics 365instance. However, you can simplify the user interface in the designer by hiding some Dynamics 365security roles from the designer. If you later decide that you want to use a security role that you deleted from Learning Path, you can synchronize the roles between Learning Pathand Dynamics 365. If your organization has multiple business units, security roles can have parent/child relationships. Only the security roles in the root business unit are synchronized. For more information about security roles, see Security roles and privileges. If a user in your organization is assigned more than one security role, precedence is used to determine which assigned security role is used for displaying Learning Pathcontent. If Learning Pathcontent is associated with a security role, any user assigned that role will see the Learning Pathcontent, even if they are assigned a security role with higher precedence that is not associated with the Learning Pathcontent. Each role included in Learning Pathhas a numeric value. The first role in the list has the highest precedence, and subsequent roles have lower precedence . When a user is assigned a role that triggers the display of Learning Pathcontent, the user will see that content even if that user is assigned a role with lower precedence that is not associated with the content. For example, if a user is assigned a role with precedence 1 and a role with precedence 20, the user will see Learning Pathcontent defined only for the role with precedence 1. If you create different content for different roles on the same Dynamics 365page or screen, users will see the content associated with the role with higher precedence. You can control which security roles are available in the Learning Pathdesigner, and set the order of roles for determining precedence when Learning Pathruns. If a user has two roles, and there is different content published for a given context for each of these roles, the user will see the content for the role that appears higher in the list. Login to Dynamics 365with an account that has Learning Pathauthoring permissions. Click Configurationat the top of the screen. To synchronize the security roles with your Dynamics 365, click Sync Roles. To set the order of precedence for the roles used with Learning Path, use the up or down arrows to move a role higher or lower in the list. Precedence is determined by the order of the roles listed on this page. To delete a role from being used with Learning Path, click the Delete button next to the role. This does not delete the role from Dynamics 365. It deletes the role in the Learning Pathdesigner to define how content is displayed to users. You can always restore a hidden role by selecting Sync Roles. When you are finished making changes, click Save. Click Backto return to the Content Library. You can create Learning Pathcontrols for the Dynamics 365mobile app the same way you create controls for the web client. To do this you must use the mobile app simulator in a web browser so that you have access to the mobile UI for pinning your Learning Path controls. This simulator is to be used only for this purpose. Copy the server name for your Dynamics 365organization from the URL displayed in your browser, for example https://contososales.crm.dynamics.com/. Make sure to include the slash (/) after .com. Determine the unique name for the org (also called instance) you want to create Learning Pathcontrols for. To get the unique name, on the site map click Settings> Customizations, and then on the Cusomtizationpage click Developer Resources. Copy the value for the Unique Namefield displayed under the Instance Referencesection. Your URL should look similar to the following: https://contososales.crm.dynamics.com/nga/main.htm?org=orgb557e46a\&server=https://contososales.crm.dynamics.com. Open a new tab or browser window and copy the full URL you created, paste it into the new tab or browser window, and then press ENTER. The first time you connect to the mobile app interface, a welcome screen is displayed while the system processes metadata and downloads customizations. Once completed, your workspace is displayed. When you connect to the mobile app version of the interface, the credentials from your login to the web interface are used to authenticate you. You'll need to leave the web interface open to avoid getting access denied errors when opening the mobile app interface. Close your workspace to display the Home page for the mobile app interface in your browser. You can then open the Content Library to create or edit Learning Path controls. For more information, see Content Library. If your organization uses the Interactive Service Hub, you can also create your own Learning Pathcontrols for the Interactive Service Hub interface. To create controls, you can display the Interactive Service Hub interface in your browser, and then access the Content Library to create or edit controls just like you would for the web interface. In Dynamics 365, go to Settings> Interactive Service Hub. This option is available only to users with the Customer Service Manager, System Administrator, or System Customizer role. Directly open it by entering a URL in your browser. Type https://<Dynamics 365 Server>.crm.dynamics.com/nga/engagementhub.aspx, and press Enter. Replace <Dynamics 365 Server> with the name of your server, for example contososales. The Content Library displays all of the content created and available to your organization, as well as the commands to create, manage, and interact with controls. To create or edit Learning Pathcontrols, first connect to the client interface for which you want to create controls, and then open the Content Library. On a sidebar, click the Content Librarybutton. Click the Trainingtile on the site map, and then click Content Library. Click the ellipses button inside a circle on the bottom-right corner of the screen. Click Learning Path Content Library. If a sidebar is displayed, click the Learning Pathicon on the sidebar. If there is no sidebar displayed, click the Helpicon in the top-right corner of the page, and then click the Learning Pathicon on the sidebar that is displayed. On the Mainmenu, click Help Centerand then click Content Libraryunder Learning Path. If you do not see all of these columns in the Content Library, it might be because your browser's View zoom is set to higher than 100%. To see all of the columns, set the zoom setting to 100% or lower. The name you used when you created the Guided Task or Sidebar. A red lock symbol next to the name indicates that the content is currently checked out. You can hover over the icon to see which user has the content checked out. A red asterisk next to the name indicates newly checked-in content. The title you provided when you added content to the Guided Task or Sidebar. Titles for Sidebars and Guided Tasks are displayed on Sidebars when they are added as links, or when they are returned as search results. Symbols that represent the form factor selected for this content when it was created, either Desktopor Tablet. The Form Factorcolumn is not displayed when you are using the Content Library when connected to the mobile app interface simulator or the Interactive Service Hub. Displays any tags applied to this content. You can add tags in the Advanced Optionsdialog box. Use tags to filter content displayed in the library. The version of the application that the control was created on. The name of the person who created the control. A numeric value that represents the number of languages to which the control has been localized. Displays Publishedif the content is currently published; otherwise the status is Draft. Displays whether the content is enabled or disabled. Only enabled content is displayed to your users. The most recent date when the content was published. You can create two types of content in Learning Path: Guided Tasks and Sidebars. A Guided Task is typically a series of steps, although it can also be a single step. A user can launch a Guided Task by clicking a link on a sidebar, by navigating to a page, or by clicking a link on a page for which you have created content. In each step, the user clicks the Nextbutton or completes a defined action to proceed to the next step, or to complete the Guided Task. Guided Tasks are useful for guiding your users through common or new tasks. They can also be used to ensure that tasks are performed consistently in your organization, or that data is entered a specific way to support your organization's processes or workflow. You can include links, videos, and other information in Guided Tasks to help your users become familiar with and learn more about the part of the user interface that the step references. A Sidebar is displayed when a user clicks the Help button, navigates to a page, or clicks a link or button on a page for which you have created content. You can also create Home sidebars that are displayed when the user opens the page or screen, or clicks the Home icon on a sidebar. You can also define Error sidebars that appear when there is a problem displaying the intended sidebar. You can include links, videos, and other information in sidebars to help your users become familiar with and learn more about the page or form displayed, or actions they can take on the page or form. Define how the task is triggered, and assign the roles to which the content applies. Use the Flow Editor to add the steps that users will see as they step through the Guided Task. Go to the page for which you want to create a Guided Task. Open the Content Library. See Content Libraryto learn how. In the Content Library, click Guided Task. Provide a name and select the other settings for the Guided Task. Use this table for reference. Select this check box to disable the Guided Task. When disabled, it will not be displayed to users. Select this check box if you want to show this Guided Task only when there is an error with other Guided Tasks, such as a lack of privileges or any issue that prevents other Guided Tasks associated with the page from being displayed. The name for the Guided Task that is displayed in the Content Library. The client value is set automatically for the platform on which you're creating content. If you edit an existing control when connected to a different interface than the one on which the control was created, the Client setting will be updated to the current client type. This will cause the control to break and not work on the client for which you originally created the control. If you are creating controls for the web interface, Web clientis displayed. If you are connected to the mobile app interface simulator, Mobile appsis displayed. If you are connected to the Interactive Service Hub, Interactive Service Hubis displayed. The form factor displayed depends on which interface you are creating content for. If you are using the web client interface, Desktopand Tabletare displayed. When selected for the web client, Tabletrefers to browsers running on tablet devices, not the mobile app. If you are creating controls for the mobile app interface, Tabletis displayed. This refer to devices running the Dynamics 365mobile app, but is supported only on tablets. If you are using the Interactive Service Hub, Desktopis displayed. Learning Path is not supported in the Dynamics 365app for phones. Select whether you want the Guided Task to display when the Page Loadsor when a Link Is Clickedon a Sidebar. This setting is for internal use only. Select the security role(s) for which you want the Guided Task to be displayed. You can select as many roles as you want. If a user is assigned more than one role, the Guided Task will appear only for the role with the highest precedence, as described earlier in this topic. Shows the status of the Guided Task. The status will be Draftuntil you publish it. Make this error guided task- Select this check box if you want to show this Guided Task only when there is an error with other Guided Tasks. Supported Languages- Select the languages for this Guided Task, and for import and export. Author- Change the author defined for this Guided Task. Tags- Add or remove tags applied to this Guided Task. Use tags to make it easier to search content in the Content Library, or to categorize your content. App Version- Set the Dynamics 365version associated with the content. Version- Set the version of the content you create. Authoring Group- Set the Authoring Group for the content you create. Publishing Groups- Select the publishing group(s) for this content. When you're finished, click Saveto start using the Flow Editor. Add your title where Guided Task Titleis displayed. This is the title that users will see. Select whether or not to show fixed ID controls only. Registered controls are outlined in green, and unregistered controls are outlined in blue when you drag the tile to pin it to the UI. 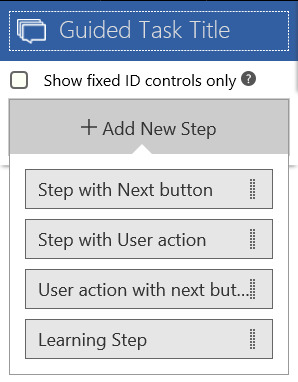 If you pin a step to a control without a fixed ID, it may be affected by a future update to Dynamics 365. Updates will not affect fixed ID controls. Click Add New Step, and then select the type of step you want to use for the first step of your Guided Task. This step has a Next button that can be used to navigate to the next step in the flow. If this is the last step in the flow, the Next button will not be shown. Drag the tile to pin the step where you want it to appear in the app. This step does not have a Next button. The user is prompted to click the UI element on which the step is pinned. If page redirection or any UI state change occurs as a result of this click, make sure to pin the next step on the changed UI state. Drag the tile to pin the step where you want it to appear in the app. Pin this type of step to a clickable control in the UI, such as a button or link. This step does have a Next button. Clicking the Next button has the same effect as clicking the UI element on which the step is pinned. If page redirection or any UI state change occurs as a result of this click, make sure to pin the next step on the changed UI state. Drag the tile to pin the step where you want it to appear in the app. This step has a customizable button as the end action. This step can only be at the end of a guided task flow. You can use it to link to a Learning Path sidebar. Drag the tile to pin the step where you want it to appear in the app. If you've already planned out your Guided Task and know which steps you want to add, you can add them all now. Each step you add will appear in the Flow Editor in the order you add it. You can reorder steps after adding them by dragging them up or down in the list. Select the type of step you want to add, and then drag the tile to the UI to pin it to a control. It may take a few tries to get used to placing the step where you want it. You can hold the tile for up to 15 seconds. If you don't pin it within 15 seconds, the tile will remain unpinned and the mouse pointer will change back to a normal cursor. When you've positioned the step where you want it, release the mouse button to pin it to the control. The step will appear in the location you selected. To move the step, use the Drag mebutton on the panel next to the step. Content Type– Add text or a video to the step. Click Editto see more settings. You can change font size, color, and style for text, and add a thumbnail for video. Placement– Specify the location of the step on the control you pinned it to. Selections include: Auto position (Selected by default), Top left, Top right, Bottom left, Bottom right, Left-top, Left-bottom, Right-top, and Right-bottom. Copy- Create a copy of the step with identical content pinned to the same location and insert it in the Guided Task flow directly after the original step. Click Savewhen you are finished positioning and adding content to the step, and then either close the step using the Close button in the top-right corner of the step, or select the arrow in the top-left corner of the screen to return to the Flow Editor. You can always edit the step later, so don’t worry if you accidentally close it before you have it just how you want it. To add or edit the next step in your Guided Task, click the icon in the top-left corner of the screen to display the Flow Editor. Add any additional steps you want to include in your Guided Task, making sure to save each step when you're finished adding content. If you reposition a step or copy it using the Copybutton on the toolbar, any unsaved changes on that step will be lost. Be sure to save your changes often. When you’ve finished adding steps to your Guided Task, click Save. Click Previewto test your Guided Task and see it how it will appear to users. To publish your Guided Task, you’ll need to preview it first. When you close a step or use the arrow at the top-left corner of the screen during Preview mode, you'll see the Check-inand Publishbuttons in the Learning Pathdesigner. If you're happy with your changes, check them in and publish the Guided Task, or publish it later from the Content Library. Set the Sidebar properties and assign the roles to which it applies. Add content to the Sidebar (text, images, links, and buttons). Go to the page for which you want to create a Sidebar. In the Content Library, click Sidebar. Provide a name, and then select the other settings for the Sidebar. Use this table for reference. Select this check box to disable the Sidebar. Select this check box if you want this Sidebar to display only when there is an error with another Sidebar, such as a lack of privileges or other issues that prevent other Sidebars associated with the page from being displayed. The Home Sidebar is shown when a user clicks the Home button, or if there is no Sidebar on the page and the user clicks Help. Each page can have only one Home Sidebar. The name that is displayed in the Content Library. Select whether you want the Sidebar to be displayed when the page loads, or when a user clicks a link or button on the page. This is for internal use only. Select the role or roles for which you want the Sidebar to be displayed to users. You can select as many roles as you want. If a user is assigned more than one role, the Sidebar will be displayed only for the role with the highest precedence, as described earlier in this topic. Select the template to use for the new Sidebar, either Single Columnor Two Column. The default template is a single-column Sidebar. Displays the status of the Sidebar. The status will be Draftuntil you publish the Sidebar. Author- Change the author defined for the Sidebar. Tags- Add or remove tags applied to the Sidebar. Using tags can make it easier to search content in the Content Library, or to categorize your content. Supported Languages- Select the languages for this Sidebar, and for import and export. When you're finished, click Saveto start adding content to your Sidebar in the designer. After you save your Sidebar name and properties in the Content Library, the designer opens. Provide a title for the Sidebar. Add the content you want to display to your users when the Sidebar is displayed. To add a new section, click Add Section. To remove a section from the template, select the section you want to delete, and then click the Deletebutton. When you are finished modifying the content in the sidebar, click Saveto save your changes, and then close the sidebar by clicking the Close button in the top-right corner to return to the Content Library. Click Manageat the top of the page, and then click Check into save your changes and make it available to other users that are creating content. When you create a Sidebar, there are several options for adding links to it. You can create a link to another Learning PathGuided Task or Sidebar, to another page in Dynamics 365, or to a web page. You can even search for Help and Training topics to link to while creating a Sidebar. After you set the sidebar properties and roles and are ready to add content, follow these steps to add links to a section of the sidebar you created. In the section you want to add links to, click the List Of Linksicon. Add a section title, and then click + Add Link. Guided Task- creates a link to an existing Learning PathGuided Task. This can be useful for providing information about a task in the Sidebar, and then linking to a Guided Task that steps a user through the task in the Dynamics 365interface. Only videos hosted on YouTube are supported in Learning Pathcontrols. If you plan to use videos in your Learning Pathcontrols, you'll need to have a YouTube account and channel to upload videos to. You cannot link to videos on a channel that is set to Private, but you can link to videos if your channel is set to Public or Unlisted. You can also set up your channel so that multiple people can manage the video content for your organization. When you add videos to your controls, you can either embed the video within the control. If you want your users to view your videos in a new tab or browser window you can add a text section to your sidebar and then add a link to your video in the text section. When you embed videos that are displayed within a Sidebar or Guided Task, you'll use the link that you get from YouTube. Learning Pathwill automatically update the link to embed the video and size it to fit in Sidebar or Guided Task tile. A user can click Full screen to view the video in full screen mode. If a user pauses the playback, or when the playback is finished, YouTube may automatically display links to other videos the user may be interested in. You can prevent this from happening by modifying the link in your control to include ?rel=0at the end. For example, after you create and upload a video to your channel you copy the video URL provided by YouTube, which is https://youtu.be/4TrYMB4pjyw. To embed this video in a control, you enter that URL into the Enter video URLfield for your control. When you save the control, Learning Pathchanges the URL to: https://www.youtube.com/embed/4TrYMB4pjyw. To turn off the display of links to other videos when the video is paused or finished playing, edit the URL to append ?rel=0to the end so that your URL look similar to the following: https://www.youtube.com/embed/4TrYMB4pjyw?rel=0. For more information on using YouTube, please see the YouTube Help Center. Users will only see Learning Pathcontent you create after you publish it. Only content that is checked in can be published. Select the check box next to each Guided Task and Sidebar that you want to publish. Make sure the control you want to publish is checked in. Click Publishat the top of the page, and then click Publish. On the Publish Controlspage, select the publishing environment(s) you want to publish the content to, and then click Publish. Learning Pathcontent is published to a publishing group. When you turn on Learning Pathfor your organization, a publishing group is created with the same name as the organization name. You can create additional publishing groups as needed. You can add multiple organizations to a publishing group, and an organization can be a member of multiple publishing groups so that you can customize content and easily publish it to different organizations. On the Publishing Configurationpage, click New PG. Provide a name and optional description. Select the organizations you want to include in the publishing group. You'll see only the organizations for which you have permissions. You can export content that you create, perhaps to share with an author of another organization, or to make backup copies. The export feature creates a compressed .zip file that contains the .json files used for your content in Learning Path. There will be one folder in the .zip file for each selected Learning PathSidebar or Guided Task. In the Content Library, select the check box next to the content you want to export. You can export content without checking it in. Click Manageat the top of the page, and then click Export. Select the option you want to use for saving the generated .zip file, and then select a file name and location. The default file name for the .zip file is the same each time you export, so you’ll want to use a unique name to avoid overwriting files previously exported. In the Content Library, click Manageand then click Import. Click Browseto select the previously exported file that you want to import, or drag the file to into the Drag controls herebox on the dialog. When you import a control it will overwrite and replace any version of the same control that is already in the library, even if the existing control is newer. Confirm that the file name displayed is the file you want to import, and then click Import. Click OKon the confirmation dialog. You can localize the content in the controls you create in Learning Path so that they are displayed to users in the language they have selected for Dynamics 365. To localize your controls, you can simply export them, localize the strings that are displayed to users, and then import the control that includes the localized content. You can import the control into the same organization, or into another organization as desired. You can localize the same control into multiple languages and then just import the specific languages into specific organizations that support user with that language selected. Localization support in Learning Path follows the OASIS XML Localisation Interchange File Format (XLIFF) 2.0 standard. There are tools and tutorials freely available for working with this common format. For more information, see XLIFF Version 2.0. For more information about user language settings in Dynamics 365, see Set personal options. Select the control you want to localize in the Content Library. Click Localizeand then click Export. After you've localized the content, in the Content Library click Localizeand then click Import. Click OKon the confirmation dialog displayed. Publish the localized control to the desired publishing environments to make the localized control available to your users. The localized content will automatically be displayed to users that have selected the same language for their user interface. An administrator can enable (and can subsequently disable) Learning Path Authoring through a setting on the General tab of the System Settings dialog box. Azure components and services that are involved with Learning Path Authoring functionality are detailed in the following sections. Note: For more information about additional Azure service offerings, see the Microsoft Azure Trust Center. Web Service serves the controls that are rendered on the client by Learning Path Runtime. Web Service also supports Designer API, which is used by Learning Path Authoring. The controls are stored by the service on Azure SQL Database. Compiler role manages the publish of a control to a publishing group. Compiler uses the queue to store messages about the Publish job. The results are stored in Azure SQL Database. Controls that are created by using Learning Path. Learning Path uses Azure Active Directory to authenticate Web Service. Learning Path uses Azure Traffic Manager to load balance the Web Service for availability and performance. Azure Storage queue is used to coordinate communication between the Web Service and Compiler roles.